Can’t make the wedding of Prince Harry and Meghan Markle? Visit the Helen and Richard Thomas English Walled Garden instead. If you’re in Chicago this weekend, that means—like most of us—you didn’t get an invite to the wedding of Prince Harry and Meghan Markle, a graduate of Northwestern University. 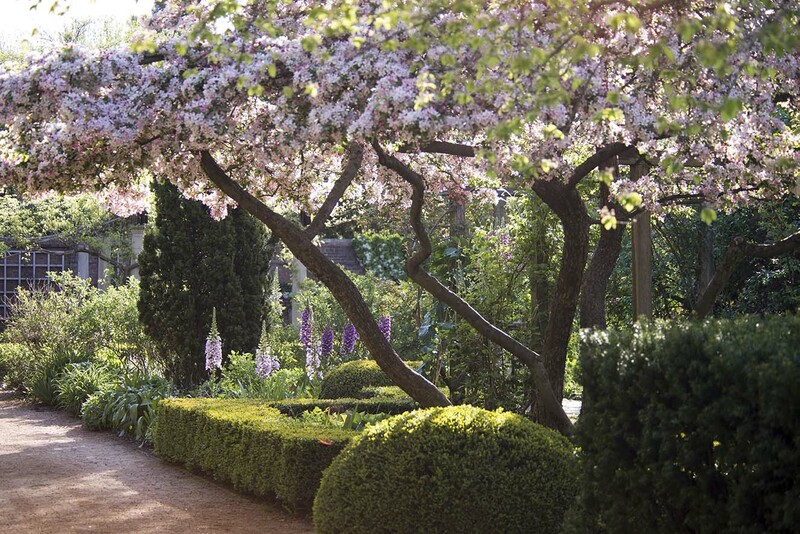 Get in the spirit of the occasion anyway by visiting the English Walled Garden at the Chicago Botanic Garden. This garden has enough connections to the British royal family to satisfy your royal appetite, and you won’t have to be up at 5 a.m. to start watching the wedding and feel part of the experience. 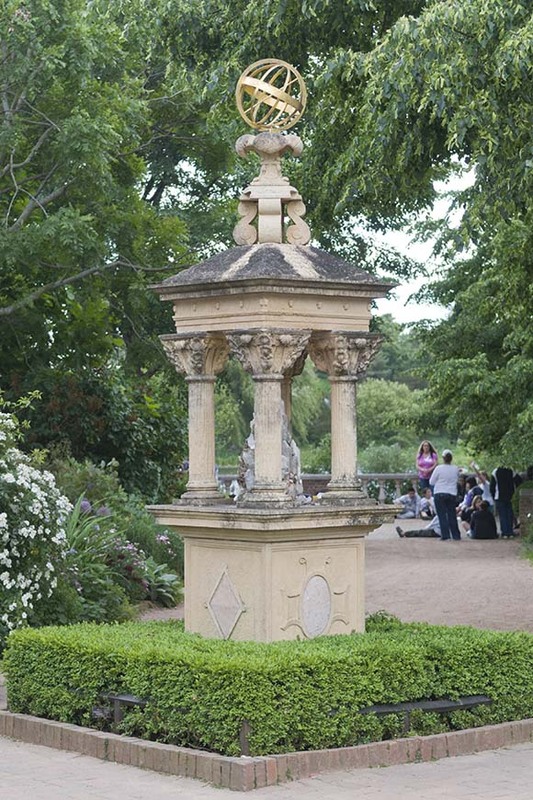 The garden was dedicated by a member of the British Royal Family. The English Walled Garden was dedicated in 1991 by none other than Princess Margaret, Countess of Snowdon, who was Queen Elizabeth II’s younger sister. The occasion was fit for royalty, with a performance from a bagpiper, and an official dedication by the princess, who sported a lovely royal blue coat. You can find a plaque commemorating the dedication just outside the entrance to the garden. 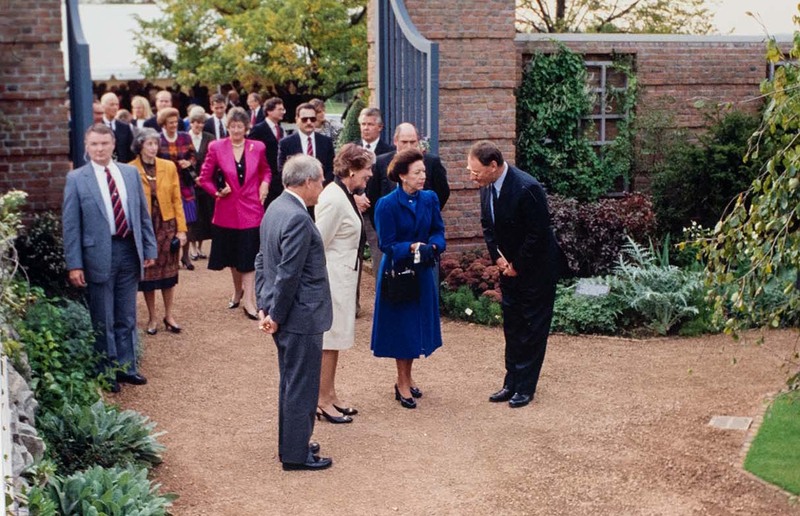 Princess Margaret visits the opening of the English Walled Garden in 1991. Designed by John Brookes, the English Walled Garden contains six “rooms” that demonstrate traditional English gardening styles: Vista Garden, Cottage Garden, Pergola Garden, Daisy Garden, Courtyard Garden, and Checkerboard Garden. 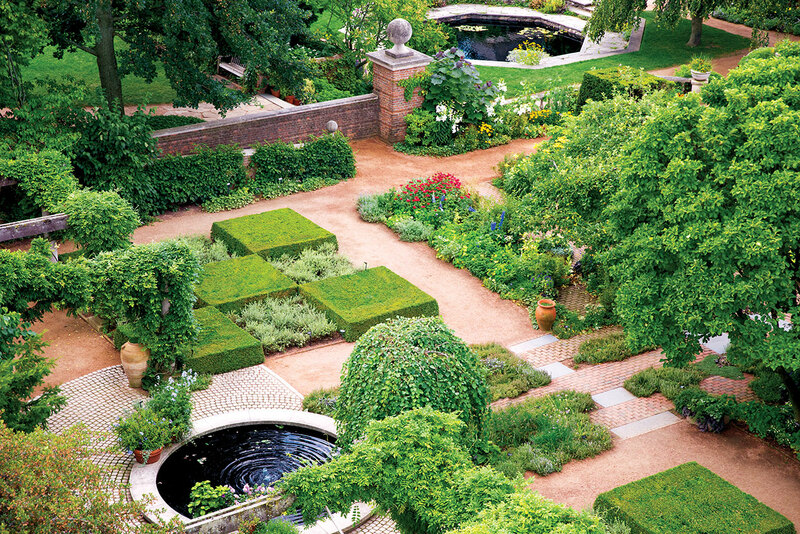 The garden is divided into six “rooms,” and one was made as a nod to the working class. The least formal of the six different spaces in the English Walled Garden is the Cottage Garden room. It’s modeled after the type of garden a rural homeowner would create, and serves to be more functional than ornamental. You’ll see fruits, vegetables, and herbs growing together, filling every space possible. If you’re someone who’s not altogether fond of the concept of royalty, the Cottage Garden is a place to visit and ruminate on how the common folk get by. Charles and Diana are there—but not together. 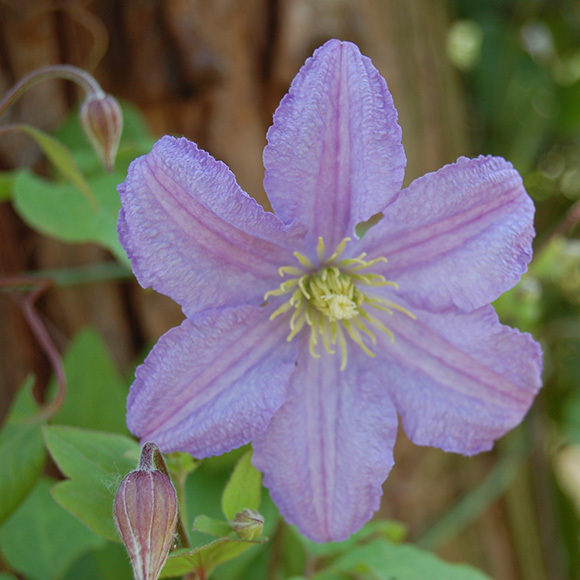 The garden features two varieties of clematis with familiar royal names. 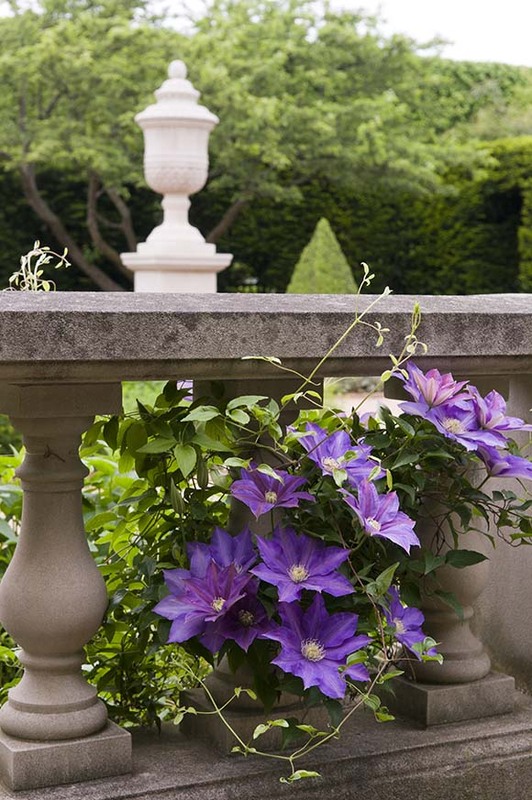 Clematis ‘Prince Charles’ and Clematis ‘Princess Diana’ are both located in the same garden bed, but planted at opposite ends. You can find them next to the ramp exit leading to the adjacent Dwarf Conifer Garden. The floral emblem of Scotland is there, but England’s is not. Planted as an annual this year along the west perennial border of the garden is Onopordum acanthium, more commonly known as Scotch thistle. The flower is so named because it’s similar to the thistle used as the national emblem of Scotland (which is technically Cirsium vulgare). If you’re looking for the national emblem of England, that would be the Tudor rose, a combination of the red and white roses of the Houses of Lancaster and York. But you’ll have to go outside the English Walled Garden to get a good view of roses. 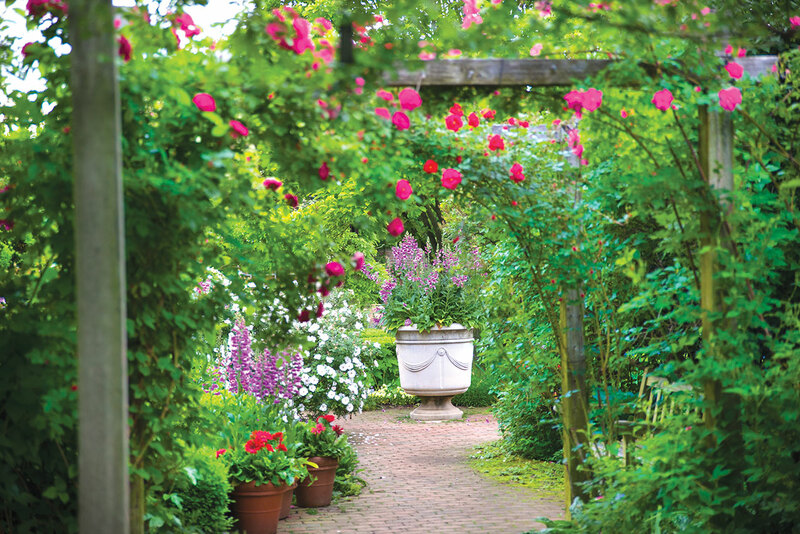 Peek through the terra-cotta tiles next to the Linden Allée or venture to the Krasberg Rose Garden next door. There’s a variety of rose named for Prince Harry’s grandmother and Meghan Markle’s future grandmother-in-law: Rosa ‘Queen Elizabeth’. The Guardian has royal connections. If you enter the English Walled Garden from the main entrance on the west side, you can’t miss the Guardian. The sculpture was carved by Simon Verity, an English sculptor who has created pieces that stand in many English gardens, including one owned by Prince Harry’s father Prince Charles, the Prince of Wales, as well as Elton John (who is definitely music royalty). Constructed of semiprecious stones and minerals, the sculpture represents air, earth, fire and water, the ancient elements of earth. Surround yourself in purple and feel like royalty. Now that spring has arrived (finally), there are plenty of blooms to be found in the traditional color of royalty. Blues and purples were a key part of Brookes’ design for the garden. You can find that color family prominently in the Pergola Garden room. 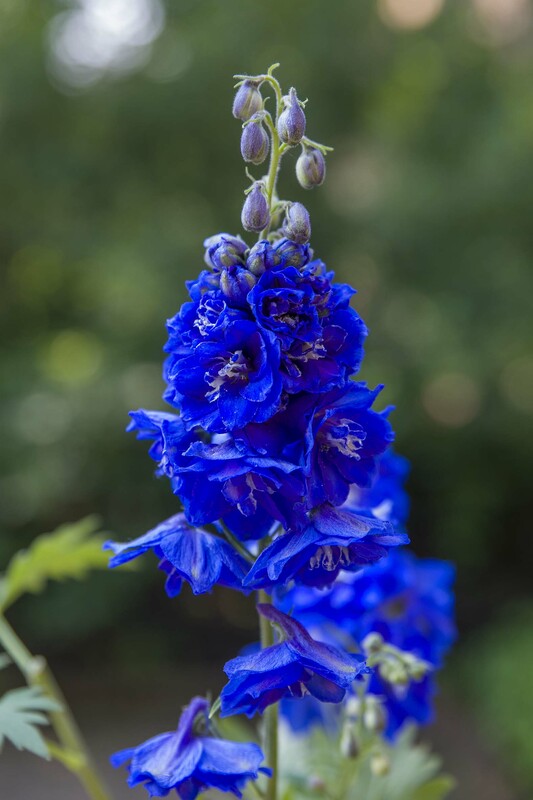 Another can’t miss purple flower in the English Walled Garden is delphinium, a stately and regal bloom newly planted in two urns close to the Linden Allée. Say hello to the lion. The lion has long been the symbol of England. The Barbary lion is the country’s national animal and also adorns a number of national symbols, from the coat of arms of the royal family to the England national football team’s logo. Naturally, there’s a lion in the English Walled Garden as well. Named Cuddly Lion, the sculpture was donated by Brookes and is located at the entrance. Wander away from the English Walled Garden to find the plants and flowers of the royal wedding. While the English Walled Garden is full of botanical references and nods to English history and culture, you’ll have to trek to the Regenstein Fruit & Vegetable Garden to find plants and flowers that are part of Prince Harry and Meghan’s wedding celebration. Traditionally, lemon myrtle from Queen Victoria’s holiday home on the Isle of Wight has been featured in the bride’s bouquet of royal weddings since Victoria’s daughter (also named Victoria) was married in 1858. The flowering plant is expected to make an appearance in Meghan’s bouquet. There’s lemon myrtle located inside the greenhouse, at the center of the garden. One tradition Prince Harry and Meghan are not following is with their choice of cake. Instead of the traditional fruit cake, their wedding will instead have a cake made of lemon and elderflower. Cross the bridge to the Fruit & Vegetable Garden and veer left. You’ll find several elder trees (Sambucus nigra) along the shoreline. Looking for a reason to head back to the English Walled Garden? Finish up your homage trip in honor of the royal wedding by seeking out lemon thyme, planted in several different spots in the English Walled Garden. Take a sniff and, with the right bit of imagination, it’ll be like you’re in London with the royals after all. 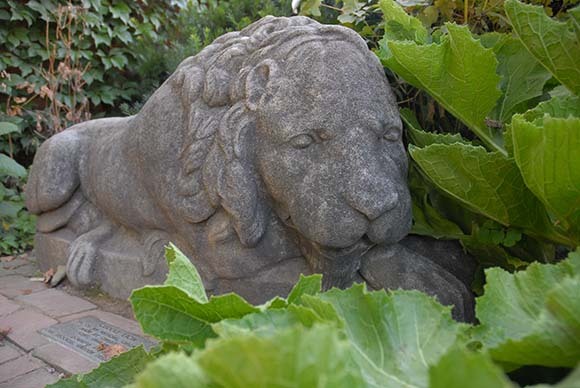 Cuddly Lion is a favorite of young visitors to the English Walled Garden. Under a grey fall sky, the English Walled Garden was blooming with color, activity, and life. Rain-glazed flowers drew tiny hummingbirds, and fountains sang. It was a special day. John Brookes, the English landscape architect who designed the suite of gardens was there for a visit, something that has happened only once every few years since the beloved site was dedicated in the summer of 1991. Clematis blooms through a wall in May in the English Walled Garden. Although the garden has grown and changed since that time, it has remained true to the original concept Brookes created. “There’s an intimacy about it that I think people like,” said Brookes, who strolled the space with a small team of Garden staff members. “I don’t think there’s another area that has this range of plant material in it,” he added. Before entering the garden, Brookes paused to soak in the entrance plantings along the west wall, evaluating the shape, color, and size of each shrub, flower, and vine. The vibrant section had been replanted since his last visit, but he nodded as if in agreement as he swept his eyes over the arrangement. He was next drawn to the perimeter of the garden that overlooks the Great Basin. The border of the space and the height and shape of trees and shrubs were his first priorities there and throughout his tour. Neatness was fundamental in his view, as he looked for carefully arranged edging such as boxwood bushes. However, in places such as the daisy garden, he encouraged the horticulturists to allow for wild messiness, and for tall, abundant blooms that create a relaxed feeling. As he walked from one garden room to the next, he admired splashes of color and white flowers that brought a light touch to the many deep green plantings and shady areas. He looked over the shoulders of a cluster of art students who were painting their own vision of the space, and nodded with approval. Sunlight shining through apples in spring bloom creates dappled shade over foxglove in the English Walled Garden. The yellow blooms of Magnolia ‘Elizabeth’ are a beacon of spring in the English Walled Garden each year. 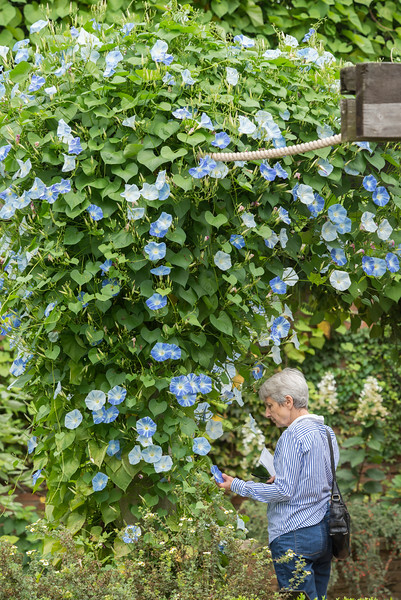 Blooming through late fall, the morning glory vines captivate visitors to the English Walled Garden. 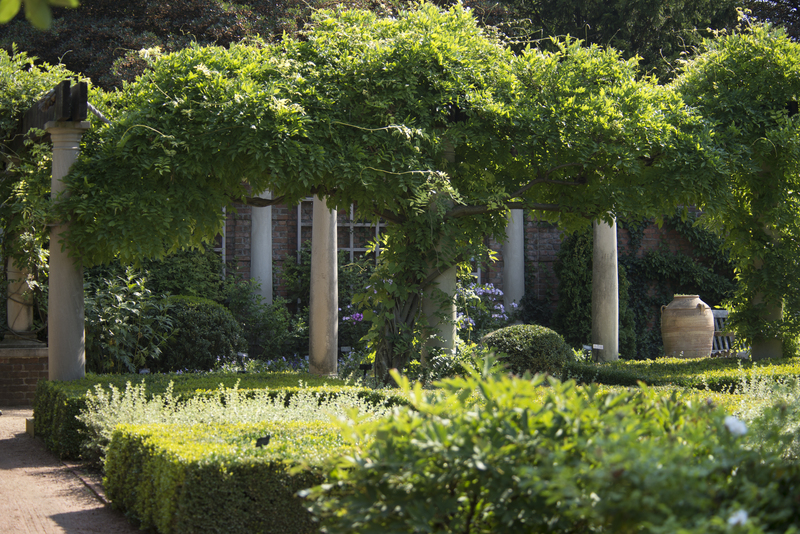 Preparing to bloom, morning glory vine creeps up the wisteria arbors of the English Walled Garden in midsummer. Again and again, he paused, considered, discussed, and nodded, occasionally spotting a new addition to the garden, or the absence of a plant that had once lived there. Always, he was looking for brightness in the form of blue, yellow, and white flowers, silvery accents, and varied vines against red brick walls. Sitting beside a trickling fountain, he noted the importance of the many water features. “It brings it alive,” he said. Water “brings light down into the garden because you get a reflection. It’s the sound, really,” he added. John Brookes, the landscape architect who designed the suite of gardens known as the English Walled Garden. Returning to the perimeter of the garden, he stopped to take in the view from beneath an English oak that was planted by Her Royal Highness Princess Margaret in 1986, when ground was broken for the garden. Brookes’ design was inspired by several gardens in England, including the gardens of Russell Page and the Great Dixter gardens. A brightly colored butterfly swept by as if to say “thank you,” while a photographer snapped a photo of a hummingbird and several women in wide-brimmed hats gathered on benches to chat. A vision come to life. Step past the sleepy stone lion, breathe in the cowslip primrose, and listen to the water trickle into an eighteenth-century lead cistern—the feeling is as timeless as the tiny thyme plants growing between the hand-pressed bricks. So how do we preserve that timeless feeling while making sure the English Walled Garden withstands the rigors of time? Work is underway to enhance the English Walled Garden’s magestical tapestry. 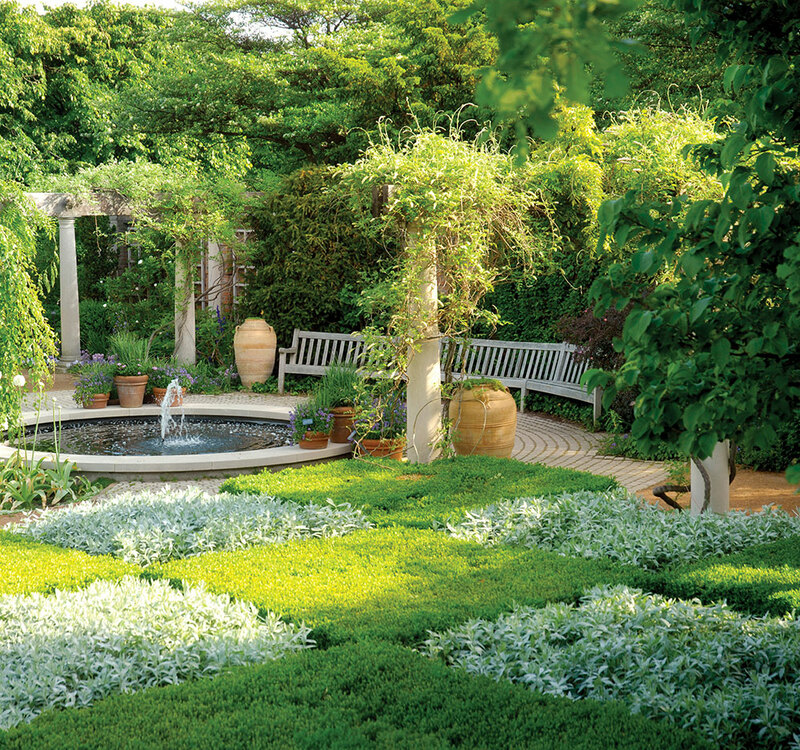 The geometric Checkerboard Garden features a formal study of contrast in texture and color. Like all gardens, this one is subject to constant change. Some plants overgrow their space and need pruning. Trees cast shadows over sun-loving perennials. And some plants succumb to disease or insects. Through generous funding from the Woman’s Board of the Chicago Horticultural Society, the English Walled Garden is updated periodically. Renovations are made in consultation with the garden’s designer, renowned landscape architect John Brookes, Member of the British Empire (MBE). Brookes most recently toured the garden in 2012 with Chicago Botanic Garden staff members, including Tim Johnson, director of horticulture, and Heather Sherwood, senior horticulturist. This year, as part of a new restoration project, the staff is rethinking the plantings. 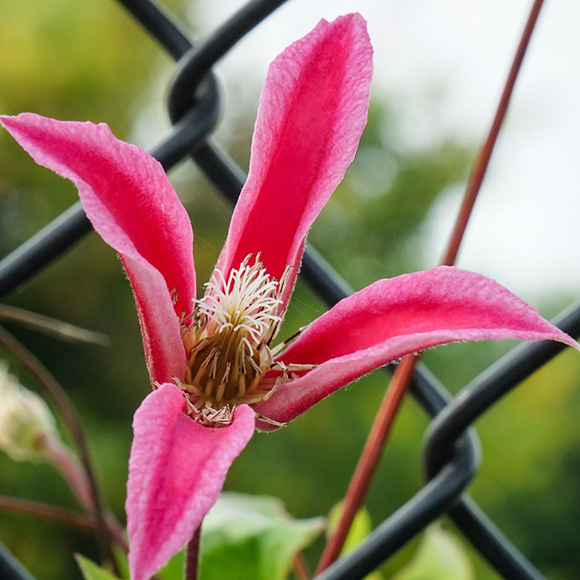 Some plants will be replaced with varieties that have more desirable qualities, such as disease resistance, increased vigor, a longer bloom period, or lower maintenance. “We’re going back to the original design plan and where it called for blue iris, we’ll work to find varieties that are new to the Garden’s collection and that fit the parameters of the original design,” Sherwood said. “We’re also simplifying the diversity of the plantings at John’s suggestion,” Johnson added. 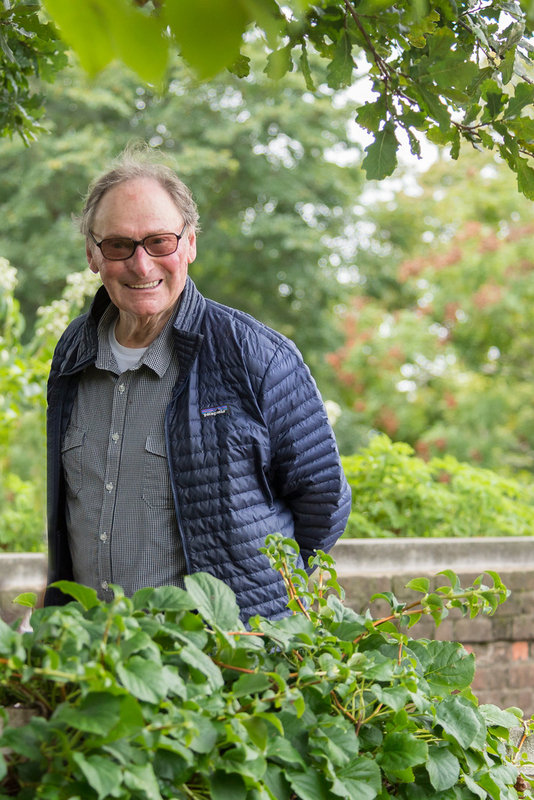 “It’s a complicated, multilayered process that will be done in phases.” One high-priority project will be to overhaul the perennial borders so visitors can continue to experience the garden throughout the year. True to Brookes’ vision, full plantings overflow their borders in the garden. This post was adapted from an article by Nina Koziol that appeared in the summer 2014 edition of Keep Growing, the member magazine of the Chicago Botanic Garden. At that time, the Woman’s Board of the Chicago Horticultural Society was in its third year of “Growing the Future,” a $1 million pledge to the Chicago Botanic Garden. Proceeds from that year supported renovation of the English Walled Garden and replacement of trees damaged by the emerald ash borer.